Forbes has just released its 2016 ranking of the world’s richest people, with 17 billionaires from Singapore making it on the prestigious list. Close to half of them are involved in the real estate business, but for many, their fortunes have dwindled amid Singapore’s weak real estate market. Property siblings Philip and Robert Ng topped the list yet again (#151 globally), but with a lower net worth of US$7.6 billion, down by US$2 billion. Older brother Robert chairs Hong Kong-listed Tsim Sha Tsui Properties, while Philip heads Far East Organization, Singapore’s largest private property developer. According to Forbes, the brothers have been expanding their footprint in Australia, acquiring trophy assets such as a hotel and retail podium in Sydney for US$342 million last year. Their latest deal, in January, was a beachfront mall in Perth for US$45 million. Meanwhile, the Kwee family made it to the second spot (#270 globally). The four brothers, Kwee Liong Keng, Kwee Liong Tek, Kwee Liong Seen and Kwee Liong Phing, have a collective net worth of US$5 billion, lower than the US$5.2 billion reported previously. They own the privately-held Pontiac Land, which started selling apartments at 53W53, a high-profile luxury residential project in Manhattan. Pontiac has partnered with a US-based developer for the 82-storey tower. Its 139 apartments, which cost from US$3 million to over US$70 million, are expected to be ready in 2018, revealed Forbes. With a net worth of US$2.7 billion, which plunged from the previous US$7.2 billion, Kwek Leng Beng is the fourth richest man in Singapore (#638 globally). Kwek’s City Developments Limited (CDL) is pressing ahead with an overseas expansion amid constraints in Singapore, said Forbes. Over the last three years, CDL has acquired eight prime properties in London for almost US$800 million. Its jointly developed 645-room South Beach hotel in Singapore opened recently. Kwek’s younger brother, Leng Joo, who was CDL’s deputy chairman, passed away in his sleep from a heart attack late last year. 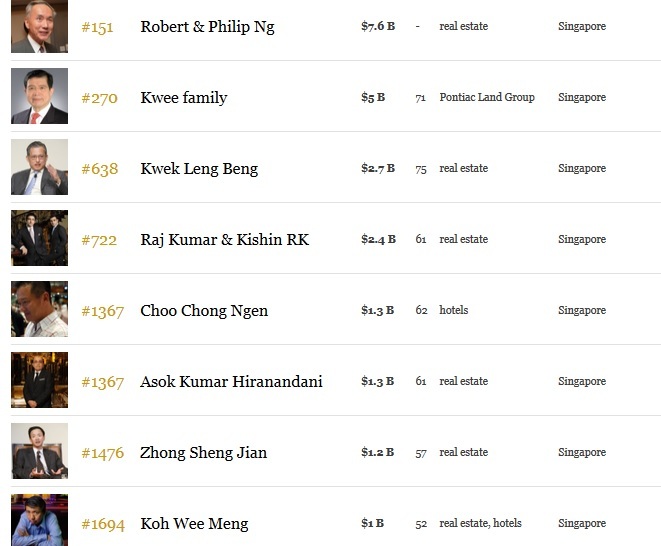 Other property magnates listed include father and son duo Raj Kumar & Kishin RK from Royal Holdings and RB Capital, who are the fifth wealthiest individuals in Singapore (#722 globally), and Singapore’s budget hotel magnate Choo Chong Ngen, owner of the Hotel 81 chain, who is ranked in 11th spot here (#1,367 globally). The Forbes list of billionaires is an annual ranking compiled and published by Forbes magazine. This entry was posted in General and tagged Asok Kumar Hinranandani, Kishin RK, Koh Wee Meng, Kwee Family, Kwek Leng Beng, Phillip Ng, Raj Kumar, real estate business, Robert Ng, Singapore's richest, Zhong Sheng Jian. Bookmark the permalink.